Simulations are frequently used for experimentation and training in many domains as a safe and cost-effective stand-in for real world experiences. However, research about which factors (trait and state) affect how real a simulation is to a person and how this “realness” affects cognition is lacking. Presence research lacks the assessment of interactions between psychological and physiological responses in interactive immersive environments. 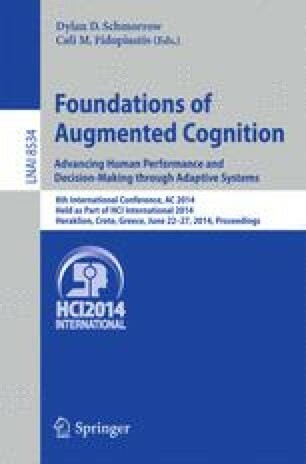 This paper provides empirical results from both trait and state psychological and physiological measures to identify and provide operationally relevant information regarding the realism of presence in a 300° immersive simulation and its effects on a Shoot-Don’t-Shoot decision-making task. Participants engaged in a Shoot-Don’t-Shoot simulation under three types of feedback conditions: (1) small shock, (2) life bar, and (3) no feedback. Results indicate that (1) trait uncertainty mitigates the stress experience and (2) both immersion and errors were significantly greater in the shock condition. Recommendations for future research are discussed.